My work takes me to some places where the local language is not English. Sometimes, I get a local guide who does all the driving for me. Sometimes, I’m on my own, just like this trip to Korea this weekend. I thought I chose a lucky date for this trip because the Asian Games 2014 is held in the same week at Incheon, Korea, less than two hours from my hotel. Better yet, the Gilas team will play against Korea September 27, 2014. 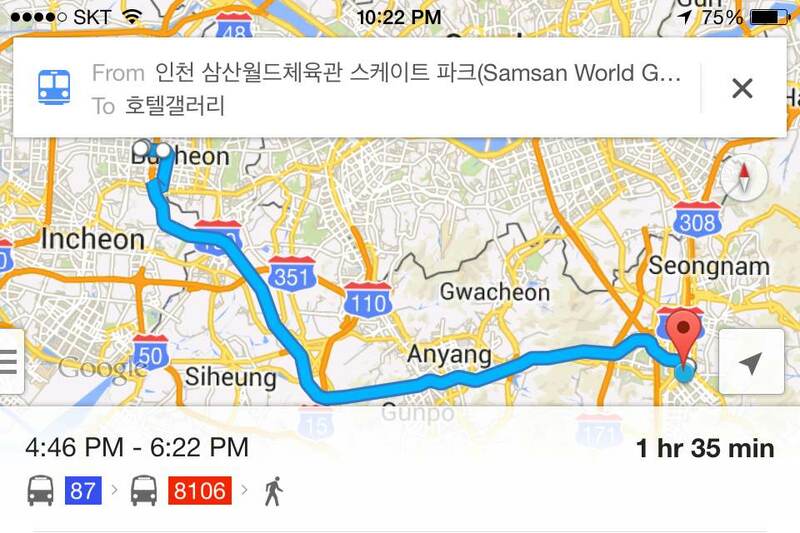 The route from Seongnam to Incheon and back. After downloading the Google Map app on my phone, I searched for directions to the Samsan World Gymnasium, the venue for the basketball game. The fastest mode of transport is via bus. Unfortunately, even if the instructions where in English, the destinations were shown in Korean. I did not get a prepaid SIM with data service because I was told WiFi is free practically everywhere. As a backup, I took screenshots of the detailed directions. The destination of this Google assisted travel experiment. The trip started with a step… because I had to walk 800 meters to the first bus station. Two hours later, I was at my destination. 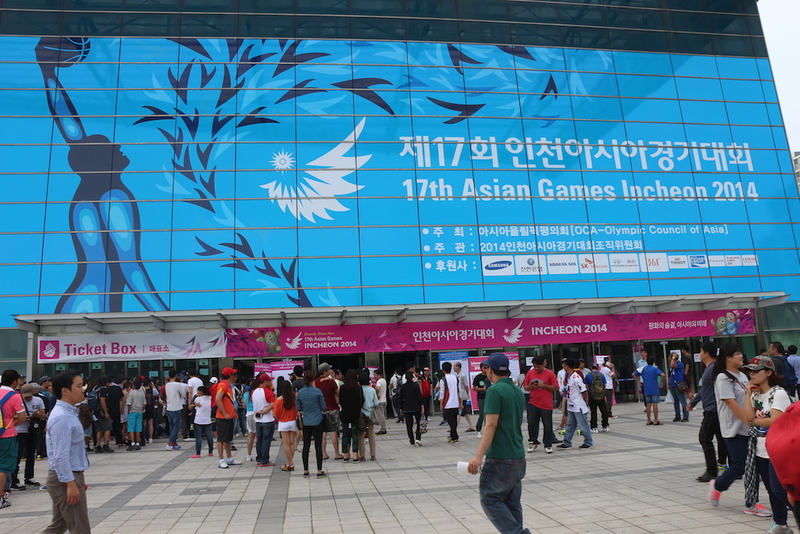 Unluckily though, the tickets to the PHL-KOR basketball game was sold out. A large crowd of Filipinos gathered around the ticket booth hoping that there would be extra tickets from other people for refund. With the game starting and the crowd inside cheering loudly, hopes for spare tickets diminished. But we still got to watch the game live on cellphones with TV service. Cheering and hopeful that the Gilas team will win given that they had a comfortable lead in the first half. Unfortunately, Gilas lost. Being among the ticketless crowd, I thought it was still fun anyway trying to enjoy the game just several meters away but could only be seen by us on “TV”. I made new Filipino acquaintances at the Asian Games, many of them OFWs while some were tourists. The Gilas fans who weren’t able to purchase tickets from the sold out PHL-KOR game at the Samsan World Gymnasium at Incheon, Korea, still enjoyed watching the gave live on a mobile phone. I did not get lost because Google Map had pretty good information on the directions while the GPS information helps me keep informed on my current location. While there are establishments with free WiFi, you have to look for them. For convenience, I would get a prepaid data SIM on my next trip so I can get information faster. The only time I asked a local was where to buy the “bus card” and if whether I was on the right bus stop for my first ride. Although I could not read Korean, I simply compared the shapes of the Korean characters on the destinations to get an idea if I am on the right track. Of course, nothing beats asking the bus driver if the bus was going to my destination.